Love him or hate him, you have to admit that Barack Obama revolutionized the art of campaign politics through his innovative use of the Internet, social media and data analytics to reach voters and harness volunteers in two successful presidential races in 2008 and 2012. Fast forward to the 2016 election, and solution providers are bringing big data to candidates throughout the field of presidential hopefuls, combining analytics with a new class of technologies such as social listening and identity relationship resolution software to give candidates the edge they need to clinch victory. So far, the 22 current and former 2016 candidates have spent $3.69 million with 67 solution providers through the end of January, according to a CRN analysis of campaign finance reports filed with the Federal Election Commission. Money that in previous campaign cycles went to a select group of political consultants is now finding its way into the pockets of solution providers offering cost-effective cloud computing services. Presidential candidates are now using technology to acquire voters in the same way businesses acquire new customers, which puts solution providers in the perfect position to help them, said Eric Berridge, CEO of New York-based solution provider Bluewolf. "As Salesforce.com has become such a vital tool for candidates, we're a natural fit to help those organizations very quickly spin out those applications and get voters," said Berridge, whose company has helped enterprises such as Newscorp and Sun Life Financial win new customers using the Salesforce.com platform. Bluewolf, No. 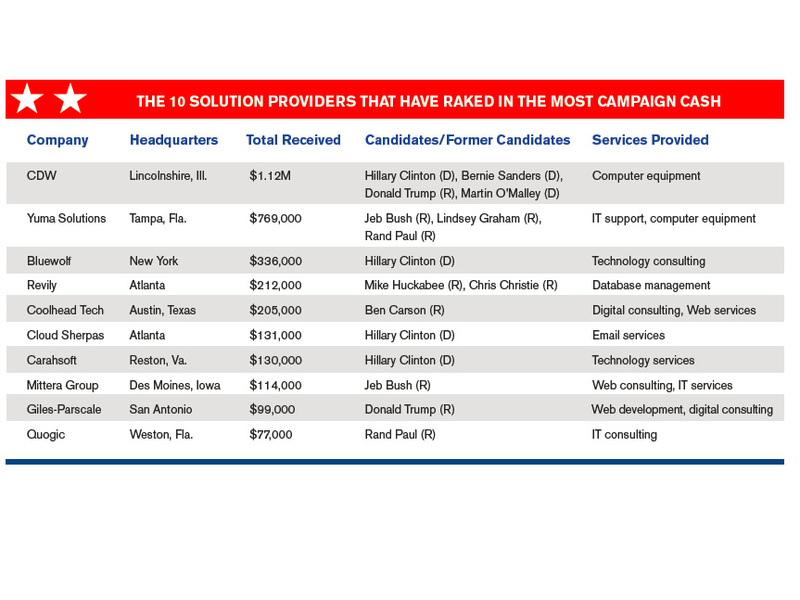 240 on the 2015 CRN Solution Provider 500 list, has provided Democrat Hillary Clinton with nearly $336,000 in technology consulting services in the current election. Presidential campaigns have made dramatic gains in using big data to attract the right voters at the right time with the right message. In this election, politicians for the first time are putting social listening and amplification techniques to widespread use, Berridge said. "The whole digital paradigm has really matured in the past eight years," he said. By gathering digital clues as to how candidates' speeches, debates, advertising, videos and door-to-door campaigning are resonating with potential supporters, campaigns can adjust their talking points to maximize their relevance to each voter segment, he said. Bluewolf is typically more granular in how it measures engagement levels for political clients—focusing on items such as message open and click-through rates—since, unlike consumers, voters only register their preferences on a single occasion: Election Day. "In a typical campaign [for a business client], you're constantly chasing opportunity," Berridge said. "But in this instance, you're preparing for one day." Candidates also are tapping solution providers to help them capture support through constituents' smartphones, Berridge said. Obama's 2008 campaign introduced micro-fundraising to the political scene, he said, where candidates raise large sums of money from a huge quantity of donors giving in increments of just $10 to $50. But this campaign cycle is the first to see mobile micro-fundraising, Berridge said, where supporters can give $20 or so just by swiping right on their smartphones. "This [mobile micro-fundraising] is definitely going to be the standard in the future," Berridge said. Candidates also are leveraging mobile devices to blast out messages about the state of the campaign to supporters, he said. CRN reached out to the presidential campaigns but they did not respond to requests for comment. More data from different sources is being used in the 2016 election cycle with traditional offline information—such as voter records—being fused together with unstructured data from social networks, said Drew Brighton, founder and partner at Washington, D.C.-based TargetSmart, which provides technology consulting and analytics tools to Democratic candidates across the country. "We don't have to have billion-dollar budgets anymore to do really sophisticated data and analytics," said Brighton, whose company is using off-the-shelf software from Irvine, Calif.-baseddata analytics software vendor Alteryx to do complex predictive modeling that would have been out of the reach of cash-strapped presidential candidates years ago. TargetSmart, for instance, is doing work on Twitter to automate the categorization of tweets about a candidate as positive or negative, said Brighton. By pairing this information with voting data, campaigns can maximize their limited resources by going after people who might turn up on Election Day and are saying nice things online about their candidate. "With politics, everything goes in terms of how to reach a voter," Brighton said. "With politics, everything goes in terms of how to reach a voter," Brighton said. If campaigns ask people to self-identify whether or not they're likely to show up on Election Day, Brighton said respondents will often overstate their likelihood of showing up. But by using specialized software, TargetSmart can match the survey responders back to their voting file and only consider the submissions of people who have historically voted in primaries or general elections. The innovations also extend to the polling side, Brighton said, where campaigns can now tie the responses from internal surveys back to what they already know about voters. This has become more relevant as campaigns have shifted from traditional telephone surveys to online survey panels to ensure that young voters, many without landlines, aren't underrepresented in the findings. Campaigns also are working with satellite television providers such as DirecTV and Dish Network to purchase television advertisements down to the household level rather than buying airtime for an entire media market. TargetSmart is, for the first time, working with several state-level campaigns on targeted TV ad buys, purchasing only the households where voting records indicate likely Election Day turnout. The big cable companies have largely been resistant to household-specific ad buys for economic reasons, though Brighton said Comcast will allow campaigns to purchase household-specific ads for DVR watchers. Campaigns also can adjust the content of household-specific ads based on the interests and opinions expressed by the residents on social networks, meaning, for example, that a candidate could leverage this data to determine which households get a gun rights ad, said Dean Stoecker, founder and CEO of Alteryx. The bottom line is that candidates are becoming savvier with analytical relationship technology, exploring new ways to reach potential supporters based on existing social relationships or nonpolitical hobbies and interests, said Josh Nisbet, director of government clients and markets for New York-based Deloitte, No. 18 on the 2015 CRN Solution Provider 500 list. After sending an email to someone on the voter roll, campaigns can now track if the recipient forwarded the email, who they forwarded the message to, and how the original or subsequent recipients reacted to the message on social networks, said Nisbet, who works with elected officials at the federal, state and local levels. This identity relationship resolution software can uncover "who knows who," helping candidates identify and reach out to new voter blocs to gauge their support and seek campaign contributions, Nisbet said. And the ubiquity of smartphones and tablets means that volunteers can now incorporate video of speeches into their door-to-door canvassing efforts, Nisbet said. Grassroots backers have decentralized a campaign's Web presence by throwing up their own websites and creating their own social media presence to support a candidate. Nisbet said it would behoove campaigns to tap into that local online support and provide it with a level of sophistication. "There's some meat behind it, and you need to have some strong investment," Nisbet said. The political battlefield has undergone a major transformation in the past several years with the advent of new cost-effective cloud computing-based software and technology, said Chris Alghini, principal consultant at Austin, Texas-based Coolhead Tech, which has provided GOP candidate Ben Carson with nearly $205,000 of digital consulting and Web services. "There's room for the modernization of campaigns," Alghini said. "The whole process is undergoing a transformation." Coolhead has leveraged HubSpot to enable local Carson campaign directors to send out emails to grassroots supporters, create online landing pages and integrate them into the campaign's broader Web presence. By using an off-the-shelf item like HubSpot rather than building custom software, he's been able to leverage existing APIs and keep costs down, Alghini said. In addition, improvements in VoIP technology mean that Carson campaign volunteers can participate in phone banks directly from their own laptops rather than having to go into campaign headquarters, Alghini said. By using RingCentral, Carson volunteers can—from the comfort of their own homes—call and text supporters, set up conference calls with up to 1,000 participants and enjoy full integration into Gmail. The remote phone banking capabilities enabled the Carson campaign to greatly expand its pool of potential volunteers in rural states such as Iowa and New Hampshire, Alghini said. Coolhead, a Google for Work Premier partner, has the Carson campaign running almost entirely on browser-based Chromebooks to lighten the IT burden and greatly reduce the need for on-site hardware, Alghini said. In an on-premise world, campaigns had to project right from the outset how large their staff was going to be in the heart of primary and general election season to determine how much infrastructure they needed to purchase. Now, since nearly everything—including the phone connections—is cloud-based, Alghini said the Carson campaign can scale up on a dime rather than waiting for the installation of a traditional phone system. "Taking that cloud route made it super easy," Alghini said. Chris Hertz, president of New Signature, a Washington, D.C.-based solution provider that provided digital consulting services to former Republican presidential candidate Jeb Bush, agreed that cloud computing is changing the face of the modern political campaign. Thanks to cloud-based solutions and off-the-shelf software, political campaigns without deep pockets can now access the same technology as the candidates with the biggest campaign war chests, Hertz said. "This has revolutionized the ability for campaigns to engage each other and the public at large in a more sophisticated way," Hertz said. Exponential gains in collaboration technology also have enabled campaigns to quickly and inexpensively get the candidate's words into the hands of the masses, he said. As recently as a couple of years ago, Hertz said the infrastructure needed for campaign staff around the country to shoot, edit and disseminate high-quality video would have cost millions and taken months to deploy. Now, with a $15 webcam and Microsoft Office 365, campaigns can get peer-to-peer and multiparty video and audio to tens of thousands of supporters almost instantaneously. The downside of the big data/cloud computing revolution is the security issues that must be addressed by solution providers. Coolhead, for its part, uses a two-factor authentication process for all of the Carson campaign's network access points. Coolhead also only supports the Gmail app for the Carson campaign since that app doesn't permit users to work around the two-factor authentication and allows for tremendous back-end control. Carson staff members, therefore, are not allowed to access campaign mail through the native email apps on iPhone or Android phones since they do not support two-factor authentication. "It's how I would want my things set up," Alghini said. Security presents an additional set of concerns for solution providers who need to create an IT system that enables volunteers to do their job but blocks them from gaining high-level access where they could do damage to other aspects of the campaign. Dan Harpool, president and CEO of Little Rock, Ark.-based Complete Computing, said his company normally grants master high-level administrator privileges on Windows Server to just one person in the campaign. From there, Harpool said, the level of access drops precipitously to provide users with only a granular amount of control. In this election, Complete Computing provided computer services for former GOP presidential candidate Mike Huckabee, who dropped out of the race after the Iowa caucus. Campaign staffers, who often aren't very IT-savvy, now call on solution providers to do a lot more than run networks. For example, candidates lean on solution providers to implement social media policies, Harpool said, allowing access to staffers permitted to post to the campaign's Facebook and Twitter account and denying access to everyone else. The technology advances in campaign 2016 have solution providers looking beyond presidential politics with an eye toward building a vertical practice around election campaigns and elected officials. A campaign manager for one of the county sheriff candidates heard Harpool's weekly talk radio show, which touches on the intersection of politics and IT, one Saturday afternoon and reached out to inquire about his availability. "Being in a small state, you have to do pretty much everything," Harpool said. Coolhead's Alghini said he has had a great time supporting Carson's campaign, and said he would definitely be open to working on additional political campaigns. "I never imagined it was going to be so much nonstop working, but it's pretty exciting," said Alghini. Deloitte's Nisbet had a word of caution, however: Contracts are sometimes not as lucrative as one would expect given that campaigns sometimes go with the firm that provides the lowest-priced bid. The true value comes in developing relationships that survive beyond Election Day, especially if the campaign is successful. Elected officials typically have very little knowledge of how technology might assist in their new role, Nisbet said, and are often open to continuing to pay proven campaign technology specialists. "They get that relationship developed early," Nisbet said, "and once you've got that level of trust, you're one of the first firms they look to once they get into office."